Xiaomi’s new Black Shark smartphone is the company’s first foray into the world of gaming. 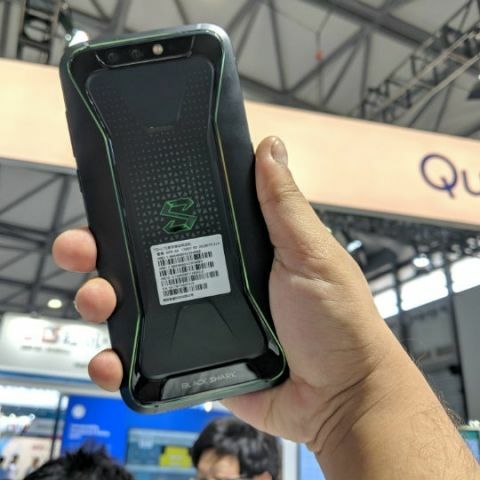 The phone has yet to make its way to India, but we did manage to spend some time with it during this year’s MWC Shanghai. The first thing anyone would notice about the Xiaomi Black Shark is the design. The phone boasts of a angular design that sets it apart from most sleek and suave smartphones in the market. At the front is a 5.99-inch Full HD+ IPS display, which Xiaomi claims that it can offer a coverage of 97 percent DPI-P3 colour gamut. While the display doesn’t offer a refresh rate of 120Hz like the Razer Phone, it does offer a peak brightness of 550 nits. Of course, hardware is what matters when it comes to gaming. Under the hood is a Snapdragon 845 SoC, that comes with Adreno 630 graphics. The phone is available in two variants. A 6GB RAM/64GB storage and an 8GB RAM/128 storage. In order to keep things cool, the Xiaomi has equipped the phone with a multi-stage integrated liquid cooling system that can bring down the temperature by up to 8 degrees Celsius. To reduces the chances of lag when playing online, the Xiaomi Black Shark features a new ‘X’-style antenna design which prevents signal disturbance when holding the phone in a landscape or vertical orientation. The Xiaomi Black Shark also sports a dual-rear camera setup. 12 MP f/1.75 + 20 MP f/1.75 with 6P lens and a dual-LED flash. The primary sensor has a 1.25um while the secondary sensor has a 1um sensor size. On the front is a 20-megapixel with f/2.2 aperture. To know more about the Xiaomi Black Shark, click here. For our first impressions, click here.